Buddhist on fire welcomes nordbeck. He is the artist behind the experimental electronic netlabels sediment and residue. He is also a big inspiration for the Sadayatana podcast. 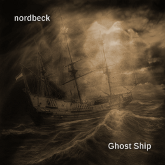 Music inspired by the stories of ghost ships. 1. The Palatine Light: "...legends agreed that a female passenger had refused to leave the ship as it sank, and those who claim to witness its reappearances say that her screams are heard from the ship..."
2. The Octavius: "The captain's log showed that the ship had attempted the Northwest Passage, which had never been successfully traversed. The ship and the bodies of her frozen crew apparently completed the passage after drifting amongst the pack ice for 13 years." 3. The Baychimo: "The Baychimo was abandoned in the Arctic Ocean when it became trapped in pack ice and was thought doomed to sink, but remained afloat and was sighted numerous times over the next 38 years without ever being salvaged." One of man’s important mistakes, one which must be remembered, is his illusion in regard to his I. Man such as we know him, the "man-machine," the man who cannot "do," and with whom and through whom everything "happens," cannot have a permanent and single I. His I changes as quickly as his thoughts, feelings and moods, and he makes a profound mistake in considering himself always one and the same person; in reality he is always a different person, not the one he was a moment ago.